Welcome to the Holiday Inn Select Hotel located in the heart of downtown Atlanta minutes from Hartsfield Int&regl Airport. A AAA Diamond hotel, located adjacent to Atlanta Braves Turner Field we offer complimentary shuttle to Centennial Olympic Park, Georgia Pacific, State Capital, Georgia World Congress Center, Bellsouth, World Of Coke, Martin Luther King Jr Center, Georgia Aquarium and other major business icons. Nearby shopping at Lenox Mall, Phipps Plaza and Underground Atlanta. Our upscale decor and spacious rooms over look the city sky line. Amenities such as marble and granite bathrooms, state of the art business center, and an outdoor pool with gorgeous skyline views further enhance the your stay. 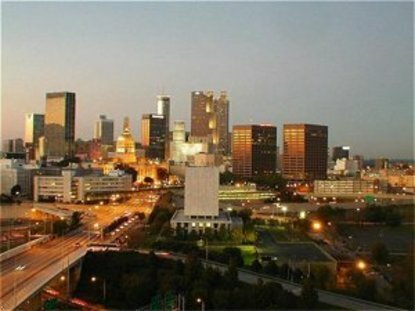 We are a beautiful hotel located at the crossroads (I-20 and I-75/85) of the South end of downtown Atlanta. Amenities such as nicely appointed guest rooms with marble and granite bathrooms, state of the art business center and complimentary high speed internet in all of our rooms further enhance the guest experience. The Holiday Inn Select Atlanta Capitol Conference Center is a downtown Atlanta hotel that offers the kind of comfort, class and service that our guests not only desire... but deserve. This hotel is committed to providing accessible facilities under the American Disabilities Act. If your accessibility needs are not met, please contact the Hotel Manager on Duty. Should you require additional information regarding accessible facilities for guests with disabilities, please call 1-800-Holiday (U.S. and Canada) or contact the hotel directly. For the hearing impaired, TDD service is available at 1-800-238-5544 within the U.S. and Canada.